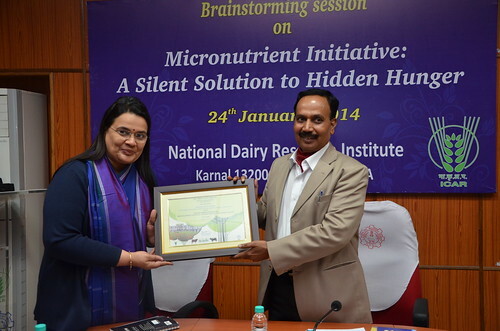 On 24 January 2014, India’s National Dairy Research Institute (NDRI) organized a national-level experts’ meeting to discuss the issue of hidden hunger – a chronic lack of vitamins and minerals needed to survive, develop and live healthy and productive lives – and the ways of addressing this serious problem. Purvi Mehta, Head of International Livestock Research Institute (ILRI) in South Asia was chief guest and delivered the inaugural address. The meeting was initiated by AK Srivastava (NDRI Director) who introduced the topic by highlighting the severity of the problem. He informed participants that 1 in 3 people in the world suffer from a deficiency in vitamins and minerals causing at least a quarter of deaths in childhood and contributing to obesity, diabetes and heart diseases. He presented several statistics in support of these facts. 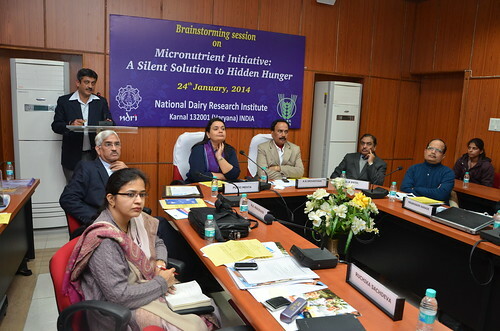 Purvi Mehta presented the global scenario of the problem and highlighted ILRI’s efforts in addressing these issues especially through the CGIAR research programs on Agriculture for Nutrition and Health (A4NH) and on Livestock and Fish. Other experts spoke about different aspects of fortification of milk as the most effective and inexpensive option to address the problem. Some experts spoke about recent research results and technical aspects involved in the fortification process and the caution to be taken to make it more effective. They shared some of the successful experiences across the world. They also stressed about the need for relevant policies and regulatory frameworks in India. Tags: micronutrients. Bookmark the permalink.